When you watch people diving into a pool from a high diving platform it looks like a lot of fun. They clamber up the stairs, make their way to the edge of the platform and launch themselves gleefully into the air before hitting the water with a satisfying splash. When you move closer and stand at the base of the platform, it doesn’t look quite so easy. Gosh it’s high up there. On the way up the stairs, reality starts to hit. “Do I have what it takes?” you ask yourself as your hand grips the rail firmly and your gait slows down to a crawl. Then you stand at the top of the platform and look around. Everyone looks so small and they’re all watching you. The water seems such a long way down and your legs feel like jelly. The person behind you is breathing down your neck eager to jump, but you aren’t in such a hurry. As you get closer to the edge for the first time, the fear grows until it almost takes over your entire body. It’s not so fun now! And then, after what seems like an eternity… you jump. A million thoughts and emotions are merged into a single moment as you hurtle towards the water. You emerge from the deep in one piece, exhilarated and relieved at the same time. You scramble from the water and run to the platform again, eager to have another go, knowing that it isn’t so scary after all. Now, replace the high diving platform with a massive goal or venture. It always looks easy and fun when others are achieving great deeds. But of course, the closer you get to the launching pad, the louder the fear and trepidation is. As you journey up the stairs, you have a critical choice to make. 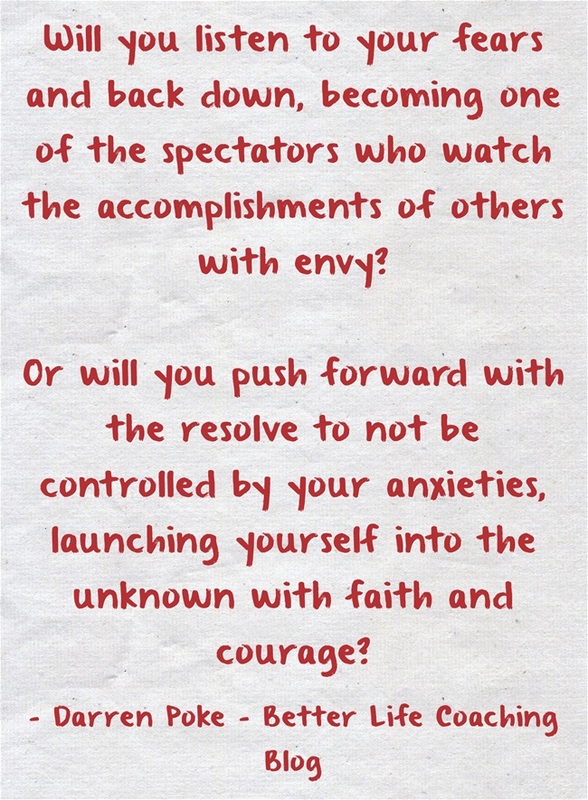 Will you listen to your fears and back down, becoming one of the spectators who watch the accomplishments of others with envy? Or will you push forward with the resolve to not be controlled by your anxieties, launching yourself into the unknown with faith and courage? And of course, once you’ve done it once, you be eager and better prepared to do it again, and again, and again. Previous post – Cut the Blue Wire! « Cut the Blue Wire!